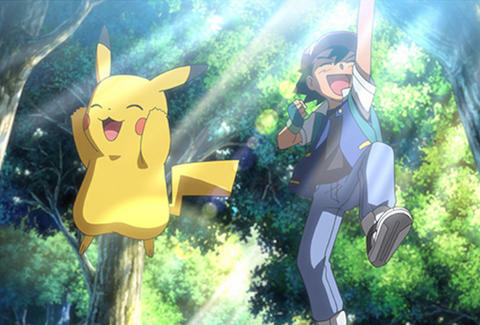 Pikachu Talks in the New 'Pokémon' Movie. This Is Bad and Everyone Is Upset. Facts about fiction aren't exactly facts. Sometimes Sherlock Holmes wears a hat and smokes a pipe; other times, he's basically a bare-knuckle boxer. People are, after all, just making this stuff up. But creators have to keep in mind basic decency, something the makers of the new Pokémon movie have apparently ignored: These deranged souls made Pikachu talk. The movie is appropriately called Pokémon the Movie: I Choose You. It recently hit the States, in honor of Pokémon's 20th anniversary, and it's basically a remake of the show's original run. Pikachu's still around, Ash is still a try-hard, but Misty and Brock didn't make the cut. If you're the kind of person who worries about spoilers for Pokémon movies, consider turning back now. Then do some reflecting about your world view and come back later. First, here's video evidence of the atrocity, along with a theater having a very strong, hilarious, and appropriate reaction. Here's the context: Animal abductor Ash Ketchum is in rough shape after saving Pikachu from what could have been a fatal attack. They're on the ground together, Pikachu in his arms, when Ash takes the opportunity to ask Pikachu why he never wants to get inside a Pokéball. Instead of pointing out the obvious discomforts of being shrunken down to the size of a Beanie Baby, and the added degradation of being strapped to a utility belt, Pikachu responds in an unsettling high-pitched voice with an uncomfortably tender reveal: "It's because I always want to be with you." Needless to say, this is a really intense, private moment, and it's probably better that we pass over it in silence. Generally, Pikachu is a yellow monster of few words, whose contribution is limited to, "Pika pi." This scene might be part of a dream/vision sequence of sorts, but there's only so much a fan can take, and even in a dream this is pushing acceptability. The voice actor for Pikachu even weighed in on the controversy. Let's just give the people (not Pikachu, please never again Pikachu) the last word here, because their interests were clearly not taken into account when this was put out into the world. James Chrisman is a News Writer at Thrillist who thinks Pokémon was better as a silent film. Send news tips to news@thrillist.com and follow him on Twitter @james_chrisman2.